LPs met een gewicht van 180 gram, gemaakt in Duitsland door Speakers Corner Records. Puur analoog, audiofiele mastering vanaf de originele mastertapes. Originele uitgever: Philips. Leveringsomvang: 2 x 33 toeren langspeelplaten in een LP gatefold cover (350gr/m2) met gevoerde binnenhoes. Planète Disque verpakt ieder album zorgvuldig in een stevige doos met opvulkartons en een luxe plastic buitenhoes van PVC. Anyone who takes an interest in Schubert’s late works will sooner or later come across cliché-like interpretations of his music that have been associated with a foreboding of his early death. Robert Schumann on the other hand was more objective when he looked at the score of Schubert’s two great Piano Trios: he characterised that in E flat major as effectual, masculine and dramatic, and the sister work in B flat major as languishing, feminine and lyrical. Both masterpieces have in common highly varied movements, which must be approached with great insight, a deeply felt sustained lyricism, and a courageous approach as regards the bold themes. 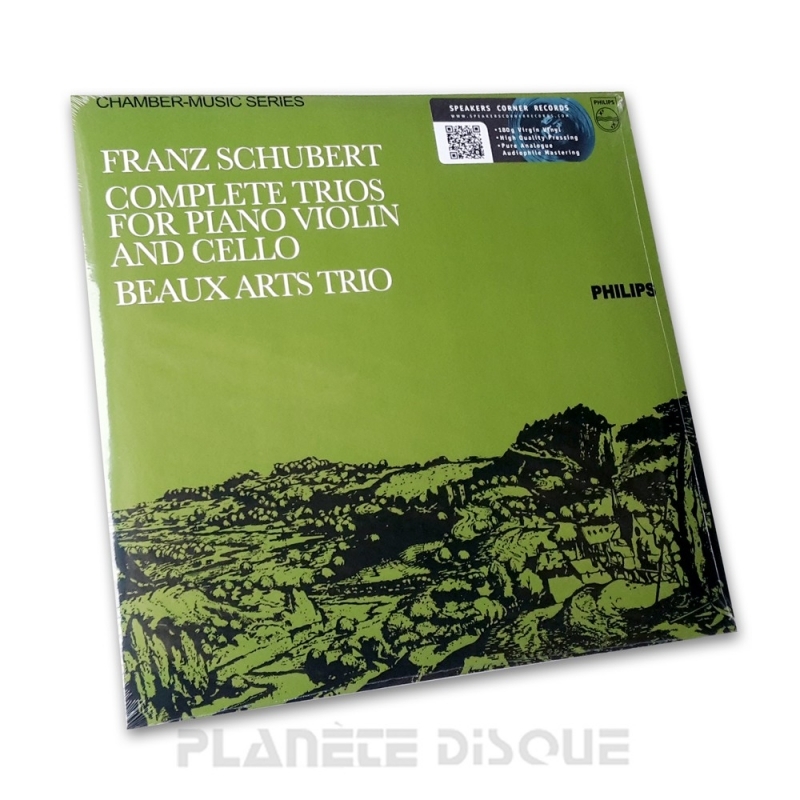 That this recording with the Beaux Arts Trio has taken on a benchmark status might well lie in the fact that the three musicians amalgamate romantic fire with analytical aplomb which results in Schubert pure. With their non-stop ebb and flow of melodies, wonderfully indulgent sound colouring and a fiery tour de force through the miraculously winding harmonic paths, the Beaux Arts Trio prove themselves to be among the very best of all Schubert interpreters. Having taken their final bow at a concert in Leipzig in September 2009 after 54 years, the time is certainly ripe for an audiophile re-release of this superb recording.